Cat Scratching Post - How to Choose the Best? Cat Scratching Post – How to Choose the Best? If you decide not to declaw your pet cat, you’re definitely going to want to invest in a cat scratching post. No matter what you might have heard you can’t teach a cat not to scratch. Your only option is to provide an alternative to the things you treasure so they don’t end up being destroyed. Here are some tips on finding the perfect cat scratching furniture for your home. Most of the cat scratching post options you’re likely to find have ledges covered in carpet material. While that’s common, it may not be the best choice for cats. First, they don’t always like the feeling of scratching on carpet. Second, if they do really enjoy the feeling of the carpet they might realize the carpet on your floor isn’t much different and may begin a routine of cat scratching carpet all throughout your home, too. Third, the edges of the carpet can become damaged after repeated scratching and cats have sometimes eaten the pieces. That’s not really very healthy for your feline. Instead, you might want to consider a cat scratching post sisal fiber or natural bark. 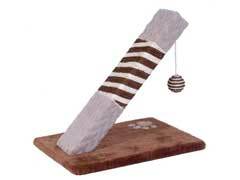 A plethora of cat scratching post designs is available. If you choose a simple post, look for one that is tall enough to allow your cat to really stretch while scratching. After all, one of the reasons for the behavior is to give those front legs a workout. Many owners prefer the cat tree scratching post which is taller and offers multiple perches for climbing. If you want to tackle the problems of shredded curtains and bookshelf climbing all at once then this is the best way to go about it. You could also pick the cat condos which include hiding places and other exploration areas for your cat. Both options will give him exercise and would be a good choice if you have more than one cat in your home. Finding the right cat scratching post can sometimes be matters of trial and error so don’t hesitate to try a few different options. Once you find the right post for your cat both of you will be a lot happier.